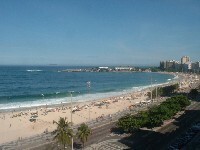 Rio rent Flat - Offer of the month: Rio rent a flat in Copacabana (Rio de Janeiro): "Boli 904": It´s an Ocean Front flat with one of the most beautiful views over the whole famous beach of Copacabana. It´s a one bedroom flat (but sleeps up to 6 persons). With air-conditioning, DVD, two cable TV`s (32``, HD), Wi-Fi, microwave ... and a fantastic Beach & Ocean views ( 180 degrees ! ). 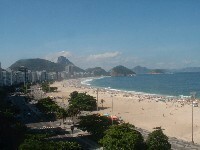 Located directly in front the beach of Copacabana and the Av. Atlântica. Price (for 4 people): US$ 80 per night. More details: Rio rent Flat "Boli 904"